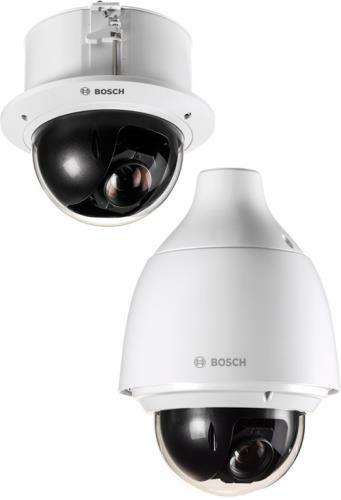 IP PTZ dome camera; 1080p60; 30X optical, 4x4 digital zoom; 120dB HDR; starlight imaging; IAE; EVA; PoE; Intelligent Streaming; clear, high-resolution, coated bubble. Dual power options. In-ceiling IP PTZ dome camera; 1080p60; 30X optical, 4x4 digital zoom; 120dB HDR; starlight imaging; IAE; EVA; PoE; Intelligent Streaming; clear, high-resolution, coated bubble. Dual power options. Flat Roof Mount Adapter for mounting a unit in an upright position on a flat surface. Tinted bubble for pendant models of AUTODOME IP 5000i cameras. Tinted bubble for in-ceiling models of AUTODOME IP 5000i cameras.